Enjoy bolder, richer, and more aromatic red and white wines with your personal crystal aerator and decanter. When you open a bottle of wine, especially a rich red flavor, unless you let it breathe for a while before you drink it you aren't getting the fullness and complexity in taste that it was designed to provide. That's why it's important to infuse it with oxygen to give an enhanced flavor and smoother finish. As you aerate your wine either by using a decanter or by pouring it directly to a glass via the aerator or by double arerating using both aerator & wine decanter, you can enjoy the full potential great taste and aroma. 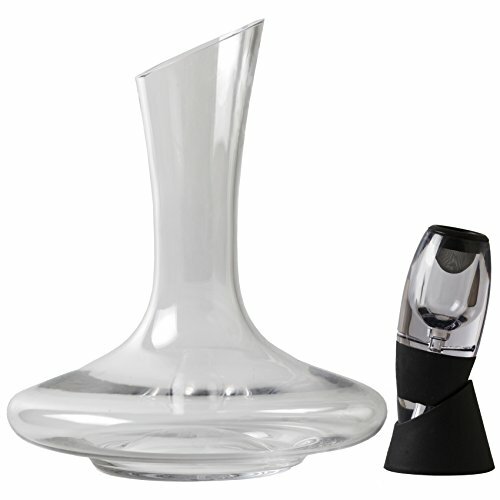 You will be amazed what a great difference in taste aerating using Hippo SB wine decanter and hand-held aerator makes!!!! The decanter gives also another elegant element due it's beautiful design. An easy-pour spout will allow you to pour the wine from the decanter into your favorite wine glass without spilling a drop. This makes a wonderful present for holidays, birthdays, anniversary or wedding. This is an unbeatable wine accessory set for anyone who enjoys wine regularly or love to serve wine with style. Inspected per FDA Standards by a certified lab. Click "Add to Cart" above to get a premium Crystal Wine Decanter and Aerator set and invest in your wine drinking with luxury accessories. DELICIOUS AERATION - This professional wine decanter and aerator infuses red and white wine with essential oxygen to bring out richer, bolder flavors and aromas. The decanter's total volume: 61oz (1800ml), DESIGNED TO AERATE: 25.4oz. (750ml bottle). THIS DECANTER AND AERATOR SET ALLOWS 3 USE OPTIONS - 1st option: use the decanter to aerate a full bottle, 2nd option: use the aerator for single glass or more & 3rd option pour the wine via the aerator into the decanter to allow even better aeration. HAND-BLOWN CRAFTSMANSHIP - The decanter is crafted with lead-free crystal, these exquisite glass wine decanters add elegance and flawless clarity when serving your wine. RESTAURANT QUALITY - A whole wine-drinking set for decanting and aerating wine. Our aerators and decanters comply with FDA requirements, inspected by a certified lab. BEAUTIFUL GIFT SET - Give this gorgeous wine decanter & aerator serving set to wine lovers and loved ones. It also comes in a designed box, use & care instructions are also included. If you have any questions about this product by HIPPO SB, contact us by completing and submitting the form below. If you are looking for a specif part number, please include it with your message.